I was disappointed to see that the not-yet-a-year-old Dolce Italia bakery has been sold. It's now called Astoria Bakery II, which like its name implies, has its roots here--Astoria Bakery I is located on 45th Street and Ditmars. I have yet to go in and check out their goodies but I'll surely miss the nutella filled linzer tarts and the giant black and white cookies from Dolce. Walking by its new storefront, I saw that Astoria Bakery II displays its baked goods more traditionally--bread in the front window and the pastries and cakes inside. Not sure yet what to make of this except that I'm deflated about Astoria Bakery's predecessor. Josephine, Dolce's owner is a lovely and hardworking woman that had pretty amazing bakery pedigree--I'm just sad that she didn't have the opportunity to show it to us long enough. But all that aside, let's welcome Astoria Bakery II to the Ditmars area. I'll report back soon with my review. Hi. 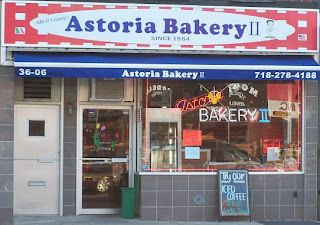 Both Astoria Bakery I which is on 45 Street and Ditmars not 41st and Steinway and Astoria Bakery II belong to my uncle Jack. I can assure you that everything they make is mmmmmm mmmmm good!!! Have a cannoli!!! Enjoy! Thanks for that correction. I'll definitely try the cannoli soon.